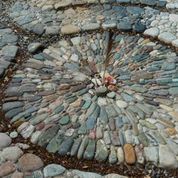 With BCB host Kayla Black, we meet Jeffrey Bales — a landscape artist who designed a stone-surface labyrinth for a small contemplative Bainbridge park that is unique for having a Tibetan prayer wheel. 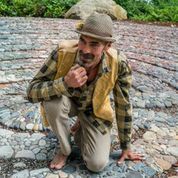 Landscape artist Jeffrey Bale pictured with one of his labyrinths. 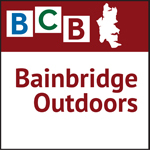 In this episode of Bainbridge Outdoors, we hear about a Bainbridge Island outdoor destination that is cherished by many — especially walkers and cyclists who are careful not to spoil the solitude. The quiet spot is on the wooded north slope above and overlooking Blakely Harbor, in southern Bainbridge Island. Labyrinths have a very ancient history with some of the earliest examples being labyrinth paintings dating back 3000 years. The ancient Greeks created many labyrinths, and Jeffrey visited the labyrinth on the island of Crete at Knossos. One of the best known labyrinths in the world is the 800-year-old eleven circuit labyrinth at Chartre Cathedral in France. Jeffrey made a point of studying the extensive history, the mythos and the structure, and then applied that knowledge to this project. 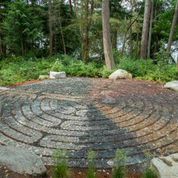 In modern times, people have begun to re-embrace labyrinths for their use in mindfulness and meditation. Labyrinths offer a walking meditation to those who walk them. Offering solace and calm to our distracted and overactive minds. Labyrinths are also used as a pathway and as a metaphorical journey to ponder life’s great mysteries — connecting us to the universe. In this interview Jeffrey talks about his intention and the process of building the labyrinth. He carried stone from several beaches around Bainbridge. Many of those stones came from around the world to our shores as ballast for ships coming to load wood. Credits: BCB host: Kayla Black; BCB production manager, studio tech and editor: Lyssa Danehy deHart; BCB nature music: Jeffrey Powel; BCB podcast art: artopia creative.